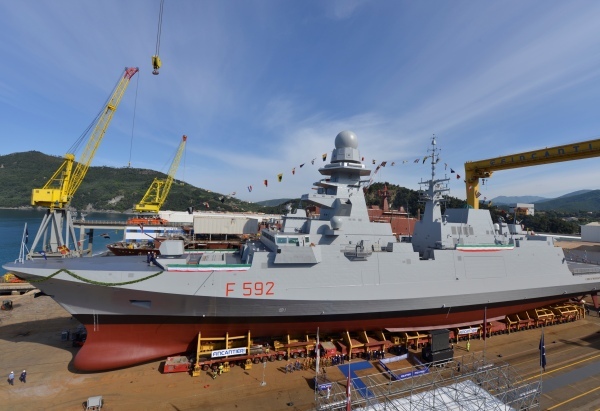 Today, at Fincantieri’s Muggiano shipyard, near La Spezia, the ship “Carlo Margottini,” the third multi-role frigate of the FREMM program, was delivered to the Italian Navy. 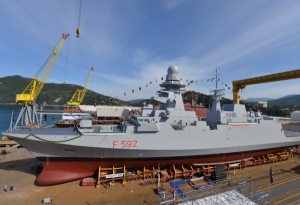 The French-Italian European Multi-Mission Frigate "FREMM" program, whose Italian prime contractor is the Horizon Sistemi Navali joint venture company (51% Fincantieri, 49% Selex ES), involves the construction of ten units, of which today eight have already been funded. "Carlo Margottini" is the third Fremm ship that Fincantieri had built and delivered, complete with its combat management system, to the Italian Navy, and the second in Anti-Submarine Warfare (ASW) configuration -- the ability of silent and fast navigation is significant in anti-submarine operations), just two months after the delivery of the "Virgil Fasan", and nine months since that of "Carlo Bergamini". On March 29 will also be launched the fourth ship of the program, the “Carabiniere,” and on this occasion there will be a high-profile ceremony for the celebration of the 200th anniversary of the founding of the Carabinieri para-military police. Measuring 144 meters in length, and with a full load displacement of about 6,700 tonnes, the FREMM frigates represent technological excellence: designed to reach a maximum speed of 27 knots and capable of accommodating up to 200 people (crew and staff), these vessels are always able to guarantee a high degree of flexibility and have the ability to operate in a wide range of scenarios and in all tactical situations. The program stems from the need to replace the Lupo (retired in 2003) and Maestrale (which will soon reach the limit of its operating life) frigates of the Italian navy, with the coordination of OCCAR, the joint organization for European cooperation armaments. These units contribute significantly to the tasks assigned to the Navy, and possess operational capacities in various combat sectors: anti-aircraft, anti-submarine, anti-ship, fire support from the sea, as well as embarked helicopters. The FREMM are intended to form the "backbone" of the Navy in the coming decades. The French program involves the construction, in parallel, of eleven units intended to replace the Tourville and Montcalm classes. Launched eight before the Italian ships, the French Fremm program has, to date, delivered one ship, with a second one due for delivery in 2014.